It's no wonder America's theatre owners named Ann-Margret "Outstanding Star of the Year." 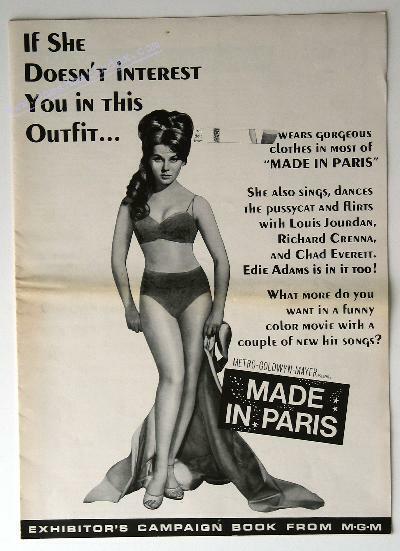 Wait until you see her in Metro-Goldwyn-Mayer's scintillating new romantic comedy-drama, Made in Paris She shakes up Paris' Left Bank, dances to Mongo Santamaria's rhythms, shimmers to Count Basie's beat, performs a wild Apache, sings, revolutionizes French fashions in a $100,000 Helen Rose-designed wardrobe, and becomes romantically involved with not one but THREE leading men-Louis Jourdan, Richard Crenna and Chad Everett. And adding to tile fun are Edie Adams and John McGiver. Everything about this picture, including a spectacular Paris Fashion Show, witil what today's girl will wear tomorrow worn by the world's most beautiful models, is designed for entertainment. Filmed on a lavish scale by producer Joe Pasternak, in Panavision and Metrocolor, it has extravagantly striking settings, ranging from sumptuous apartments, fashionable restaurants, the rich appointments of a Paris fashion house, night clubs and bistros to the excitement of Les Champs Elysees. in Stanley Roberts' story of a beautiful girl who is sent to tile French capital as a fashion buyer, meets the city's leading designer who tries to teach her about the latest fashions in love; is given a whirl by an American newspaper man who knows his Le ft Bank and his rights with Worn- en ; and, finally, has to decide between them and tile boss's son, who has chased her across the Atlantic. Louis Jourdan plays tile designer, Richard Crenna tile newspaperman, and Chad tile boss's heir. And Edie Adams is tile gal Jourdan thinks is occupying his bed when he returns to his apartment one night until he discovers that Ann-Margret has unknowingly substitiited for her career-girl friend. The comedy hi-jinks are enlivened by the film's nightclub and other musical interludes in which lilting melodies are introduced, some sung by Ann-Margret and Louis Jourdan, others used as a background for the spirited dance numbers. They include the pensive "Paris Lullaby," sung by the duo in a lovely sequence Ofl tile bank of tile Seine, Made in Paris sting by Trini Lopez, Count Basie's "Skol Sister" and "Goof Proof," " My True Love" and a rousing rendition of "You Gotta See Momma Every Night" by Ann-Margret and Reta Shaw. Boris Sagal is responsible for tile fast-moving and light-hearted direction of Made in Paris; Milton Krasner for the striking photography; George Stoll for the music score; and David Winters for tile choreography. But that spectacular Fashion Show of Helen Rose originals alone makes this captivating romantic comedy worth seeing. And don't think the males in tile audience won't have their eyes glued to tile screen when they watch those stunning models parade around in everything from a Persian Lamb ski skirt, to a 14-Karat gold evening gown trimmed in sables, to a half-ounce chiffon nightgown! Put Made in Paris down on your MUST list. It's tile entertainment gem of the year.